@totebo showed me an online construct code editor and player and thought it would be nice if gideros had something similar, based on google drive storage. nice, i'd add a link to the reference guide. I would feature it on the homepage too! and on main page the 'supported platforms' should include html5 and winstore. Is it possible to make this editor read/run a normal Gideros project from Google Drive or maybe Dropbox? By normal I mean a Gideros project created in Gideros Studio, with files and folders/subfolders etc. Currently the online editor doesn't read gideros studio's .gproj file, it just load all lua files found in the project directory. This could be enhanced probably. If you want to host it on your own server, just grab editor.html file from http://apps.giderosmobile.com/player/editor.html and put it along official gideros html5 player files. You may need to update gideros.css file too, and register a drive API key for you domain, but all in all there is not much to do. Feel free to improve the code, it was just an attempt. @hgy29 Thanks for clarifications. 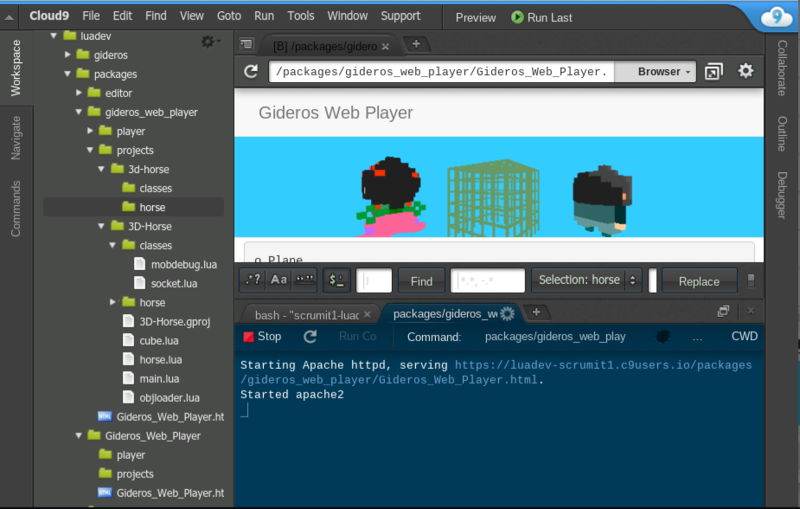 If I launch the HTML5 player on my computer for example, by opening gideros.html from the HTML5 folder, where should the project be located in order to be launched automatically in the player? I guess it should be in a certain directory in the HTML5 folder? Can gdrbridge be somehow compiled for linux? @hgy29 I managed to modify your script to read a Gideros project from a local folder and run it. I am using cloud9 and it works with all the projects I tested so far. The only things missing are that when it reads the .gproj file, it does not read the project properties (most of them can be anyway set in the code) and does not compute dependencies (not sure yet how to tell this to the player), but a way around this is to carrefully set the order of the files in the .gproj file. The Run button runs the project without reloading the files. The Reload button reloads the project files (including the .gproj file) and then runs it. Basically Run is just for restarting the game and Reload is for when you make changes in the code. Another limitation is that the project path and name have to be set manually in Gideros_Web_Player.html (I tried to make the place as visible as possible). I have attached a zip file containing the player and a test project. Unzip it and launch Gideros_Web_Player.html. You can run it from your computer or better in cloud9, they have a very good online editor (the whole environment is actually very good). I have also attached a screenshot of the Cloud9 environment. I hope this is useful for people who can't install Gideros on their (e.g. work) computers. They can now use cloud9 for instance to continue working on their projects. It's not maybe the ideal solution and for sure it can be improved, but it works. is there any alternative to cloud9 which does not need your bank card? @keszegh Try to sign in using your github or bitbucket account, you would need one anyway for versioning your game and this is quite well integrated in cloud9 (Bitbucket allows unlimited private repositories). I used this option quite a while ago but I didn't need a card. @grotly, maybe they changed their registration process, but even if i use github or bitbucket it just wants to connect the account, first you have to make a c9 account.. using a card. @keszegh you are right, they have indeed changed the signup procedure. You can also try codeanywhere.com or codenvy.com hopefully the Gideros player works there too. @grotly, thanks, i will try them out, codeanywhere was easy to register to. That's a great idea! Would be very impressive to see all examples live in a browser for people just browsing SDKs. Gideros is totally fantastic work. Congratulations to everyone who has contributed. I've played around with the C9 hosted web player for a few days and got this working on an Acer Chromebook R11 - the little touch screen Chromebook that can run Android apps. The file navigator on the left shows one problem that might be frustrating others doing this. File and folder names are case sensitive in *nix but not in Windows. When I unzipped the zip file from @grotly into my instance of C9 it had a mix of lower case and upper case. I copied the files across into the Upper case folders and it worked.